About 1,200 people attended the fourth annual Cherry Blast party in Anacostia. Trapeze artists hovered above a crowd. A band played electronic music as green lasers flashed through the room. Nearby, people created silk-screened T-shirts, a video installation played against the wall and the crowd tossed a large, clear plastic bubble filled with pink balloons in the air. 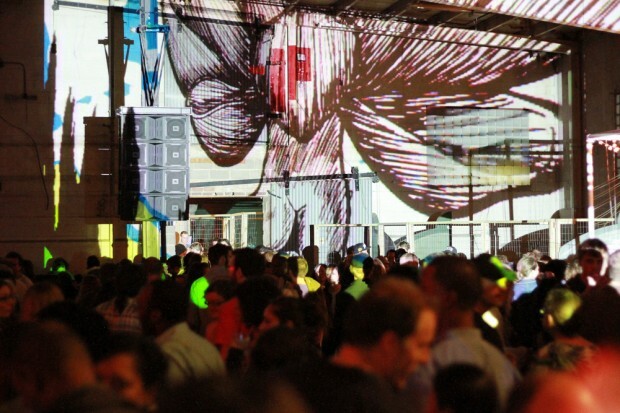 The annual Cherry Blast event on Saturday night was in many ways a creative, warehouse party. It pulled together all sorts of artistic and musical spectacles that attracted a racially diverse crowd of 1,200 willing to pay $10 a ticket to enter. But this party didn’t happen in Northwest or near gentrifying H Street NE. Cherry Blast, produced by The Pink Line Project, took place in a vacant police evidence warehouse in Anacostia, and drew attendees largely from other parts of town, many of whom were young and white. Anacostia has a rich history, but in recent years the neighborhood has developed a reputation as dangerous and poor, a perception that local activists have been battling. It’s a mostly black neighborhood that doesn’t typically attract many white people. Cherry Blast comes on the heels of Lumen8Anacostia, a weekend of art events and pop-ups held throughout the neighborhood. These events have given people, who normally don’t trek east of the Anacostia River, a reason to visit the neighborhood. But in doing so, they’ve raised questions about race and class. The District continues to have one of the largest gaps between the rich and poor. 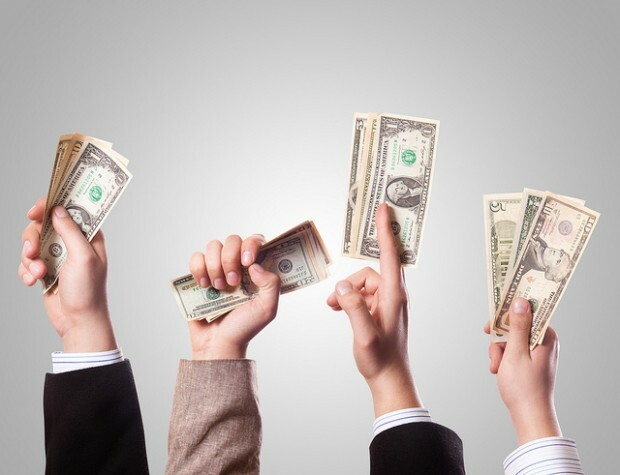 Income inequality in large cities is higher only in Atlanta and Boston. Senior citizens attend a meeting with their senator about Social Security at the Isabella Geriatric Center in New York City. 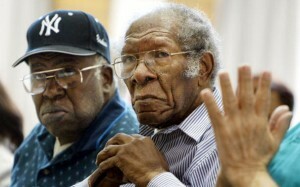 Black seniors, on average, rely more heavily on Social Security than whites. Poverty is higher among black and Latino seniors than white seniors. The poverty rate among all seniors is about 9 percent. For white seniors, it’s 7 percent, while for black and Latino seniors, it’s 19 percent. People of color over 60 years old are more likely to live in poverty because they rely on fewer sources of retirement income than white seniors, according to the study’s authors. High-poverty neighborhoods — like those east of the Anacostia River in DC — didn’t occur “naturally” nor do they reflect the “choices” of poor families about where to live. Instead, these places represent the legacy of decades of racial discrimination, legally sanctioned segregation, and public housing policies. And our map shows just how stubborn this legacy is; despite dramatic demographic and economic changes sweeping the Washington region over the past two decades, poor Black families have remained highly concentrated in DC neighborhoods east of the Anacostia River. Gentrification takes place when middle and upper-income people move into low-income communities, which ushers in economic change, reinvestment and development. Jumping back a few weeks ago, a discussion took place on DCentric when we pondered a more specific kind of gentrification: gentefication, which is when low-income, immigrant Latino neighborhoods are gentrified by second-generation, well-to-do Latinos. So we wondered: is gentrification much different when gentrifiers aren’t white, so much so that it requires its own term? Thomson Elementary School students listen during class. D.C.'s school-aged population doesn't exactly mirror its general population. The school-aged population is disproportionately black. Although nearly half of D.C. residents are black, about 70 percent of school-aged children are black. The Hispanic student population comes close to reflecting the larger Hispanic population. While a little more than 9 percent of D.C. residents are Hispanic, about 11 percent of school-aged children are Hispanic. Whites are more likely to opt out of public schools. The District’s white population has grown in recent decades, but its school-aged population hasn’t kept pace. While about 35 percent of D.C. residents are white, only 14 percent of D.C. school-aged children are white. The study also noted that whites are more likely than their black peers to opt out of public education in favor of private schools; 9 percent of DCPS students are white. A DCPS or charter student is more likely to be living in poverty than the average District resident. About two-thirds of DCPS and 75 percent of charter school students receive free or reduced lunches; to qualify, a family of four has to make $41,348 or less a year. Only about 30 percent of D.C. households fall into the same income category. Well-performing schools are found everywhere. There’s a higher concentration of top performing schools in wealthier parts of town west of Rock Creek Park, but such schools also exist in low-income communities, according to the study. 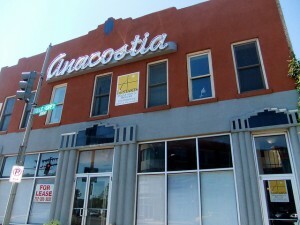 Anacostia's commercial corridor is filled with vacancies. A vocal group of Anacostia residents have been rallying against a nonprofit’s plans to open transitory housing along the neighborhood’s business corridor. Calvary Women’s Services hopes to open along Good Hope Road, SE by summer, and provide semi-permanent housing for 50 formerly homeless women. On the one hand, the objections can be viewed as typical NIMBYism. There’s also fear that placing transitory housing on an underutilized commercial corridor will cripple future economic development — while many of D.C.’s neighborhoods have undergone a transformation in which vacant buildings are converted into coffee shops and sit-down restaurants, Anacostia has lagged behind. But the opposition in Anacostia is complex, which many residents say has become a dumping ground for social services because of the community’s demographics. “There’s this perception about Anacostia that it’s all a bunch of poor black people who are out here struggling, and that they’d be happy to have [more social services] here,” said Nikki Peele, Congress Heights on the Rise blogger. Occupy DC protesters block the intersection of 14th and K streets, NW. 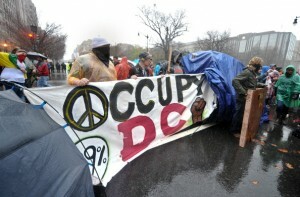 The Occupy Movement spreads around the world and takes root in D.C. The Occupy Movement began in New York City and spread to other cities, including D.C. Protestors have focused much of their ire on the economic inequality that’s left the nation’s wealth in the hands of a very small minority. There has been a fair share of criticism of the movement, including some targeting its lack of representation of those who have been most hurt by the economic crisis: people of color. In recent weeks, protesters have decamped in numerous cities, but their presence remains in D.C. This was a landmark year for the District when it comes to demographics. D.C.’s black population dipped below the 50 percent mark sometime in February, according to census estimates. This comes after more than four decades of the District being “Chocolate City,” a nickname reflecting its status as a majority-black city. 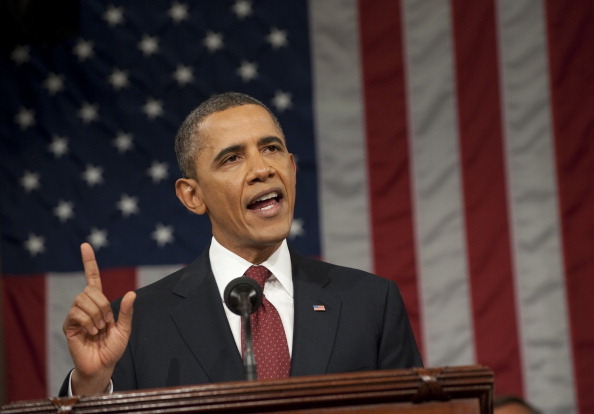 D.C. also led states in population growth in 2011 for the first time in more than 70 years.